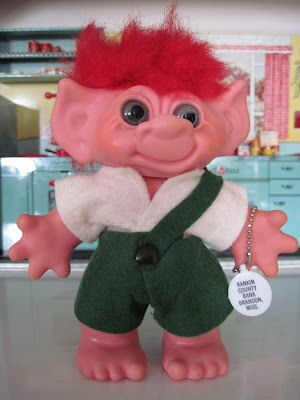 Scandia House made some of the most beautiful trolls of the 1960s. They're notable for their luxurious 'dos: big, BIG poufs of gorgeous mohair. I read somewhere that at the height of the 1960s troll craze, an entire year's production of Icelandic mohair was purchased by troll manufacturers. That's a heck of a lot of troll hair! Anyway, this girl has some of the most unique mohair I've ever seen on a troll: it actually has a frizzly wave to it, and, being undyed, it reveals its natural tint, varying from gray to ivory. She wears a vintage troll dress in a fashionable '60s print. One of the highlights of toy collecting is finding a group of toys that have remained together since they were packed up by their original child owner. It's interesting to see what children liked to keep together, and how they played with and stored their toys. Some of my oldest such finds date back to the 1890s (a doll trunk full of bisque dolls, their furniture, accessories, and tea sets). One of the quirkiest is much more recent: a group of 1960s trolls, found inside a vinyl troll house, where they had been carefully stored by their original owner. 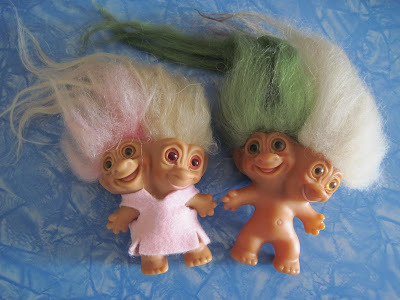 Said child was clearly a very tidy and color-coordinated kid: her trolls were selected for the way their hair and clothes complemented each other. I call them "The Bloo Family". 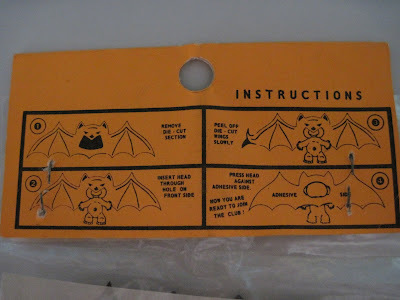 They're in minty shape too: this child was clearly a neat freak. 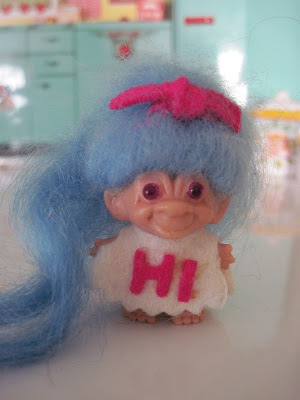 Mrs. Bloo is a 3 1/2 inch troll by an unknown maker. She has white mohair and wears a vintage felt troll dress and hair bow. Mr. Bloo, besides being a nudist, is a '64 Dam with a fantastic shock of blue mohair, and their daughter is a tiny 2 inch Scandia House pencil topper. This guy, also blue of course, was in the case with the family of trolls above. I call him "The Bloo Family's Crazy Uncle, Who Lives in the Attic". Here's another of the troll houses that were made for the little characters back in the 1960s. This one is the Wishnik Troll Shanty Shack, made by Ideal for Uneeda's Wishnik trolls. This was the house of choice for rural and mountain dwelling trolls who enjoyed banjo strumming. I love vintage gumball machine prizes as much as I love trolls, so these next few items, tiny trolls sold in 1960s gumball machines, are some of my favorites. First up are these 2 inch tall pencil toppers with yarn hair and rather frightening expressions. I keep one on my favorite pen at work, and everyone leaves it alone. 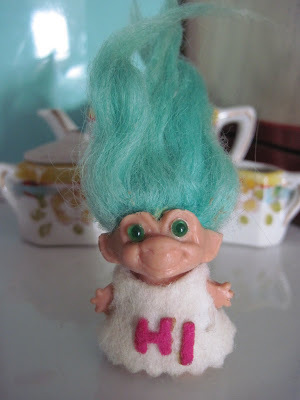 Next are my tiniest trolls: just 1 inch tall. They're cuties. Trolls dressed as cheerleaders comprised a hugely popular subset of the 1960s troll output. Some wore customized outfits for particular colleges and universities, while others sported generic "State U" costumes like these. Made by Uneeda, these Wishniks are ready to rah-rah. The larger, 8 inch version is a hard to find size. Here's one of the most rarely-seen vintage troll accessories: the Troll Car made by Irwin Toys in 1965. The 10 inch long car, sized to fit a standard 3 inch troll, is made of molded plastic in a lovely "fake log" design. It originally had a gold foil "grill" sticker on the front of the hood, that read "Irwin Wishnik REG'D T.M. of Uneeda Doll Company Incorporated c. 1965 by Uneeda Doll Company Incorporated." (Whew!) This lengthy declaration was the only such identification on the car, and unfortunately, the stickers invariably fell off. When the troll car is found today, it is almost always missing the sticker. For this reason, remaining troll cars are often misidentified as Flintstones toys (there's an eBay search hint for you). by their original young owner. Packages of outfits and related accessories were sold for trolls during the 1960s craze, and the items seen here (hair curler, telephone, rolling pin and cookbook, shoes, etc.) all came from such sets. The tiny "baby troll" was a gumball machine prize. Shortly after finding this lot, I came across a matching boy troll, and he happily moved in with the lady troll. Her 40 years of single-parenthood are now over. 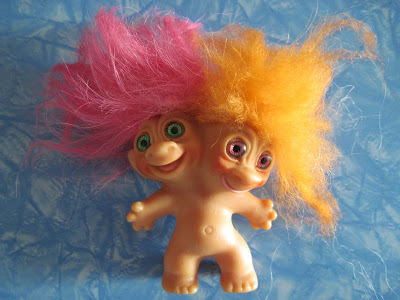 Here are two of the sweetest vintage trolls in my collection. 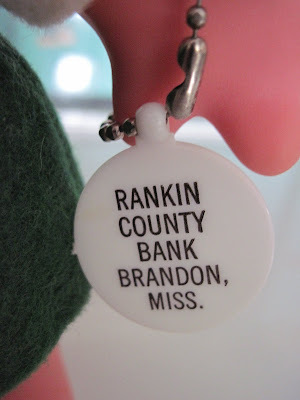 Measuring only 2 inches tall (not counting their hair), they have pins on their backs so you can wear them, and for some reason they have "HI" spelled out in felt letters on their fronts. They're a fashion accessory and a low-tech communication device rolled into one! Here's one of the Hi! 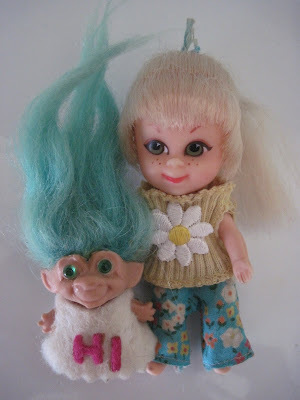 trolls with her friend, Kampy Kiddle, a 1960s Liddle Kiddle doll. They just looked like they belonged together when I got them, and now they're inseparable. 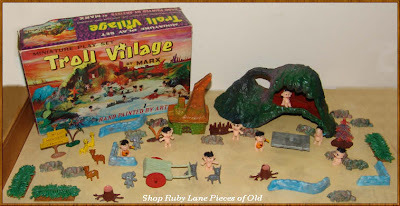 Only two days ago, I was here lamenting my lack of the fabulous 1965 Troll Village Playset made by the Marx Company. 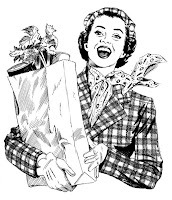 Well, the toy gods have smiled upon me: I just found my Troll Village, in the online antique shop of one of my favorite dealers, and my sweetie was prevailed upon to buy it for my birthday (which is three months away, but that's close enough, in my opinion). Doubleniks, the two-headed Wishnik brand trolls, are much sought by troll collectors, and tend to be much disliked by everyone else. ("Please turn those around," my friends say when they visit. "It's like they're watching us...") Strange though they may seem, Doubleniks have strong folkloric roots: multi-headed trolls feature prominently in Scandinavian tales, although their toy counterparts are less frequently seen. Here are my three, or six, depending on how you count them, all made by Uneeda in the 1960s. with premium "spiral eyes" and day-glo hair. These two feature cotton candy and vanilla mint color schemes. The girls on the left wear a vintage troll dress. The Doubleniks at home. It's a bit crowded. This particular 1960s troll is one of the rarest and strangest in my collection. Measuring 19 inches tall, it features a vinyl troll face on a stuffed body of synthetic fur, along with, inexplicably, a patched hillbilly type vest. It's like a psychedelic cross between a troll and a teddy bear, and for this reason is frequently called the Teddy Bear Troll. It's yet another toy that tends to disturb people. As one observer put it, "he looks like he's just waiting for you to turn away so he can attack and eat you." I keep him in a securely closed cupboard. 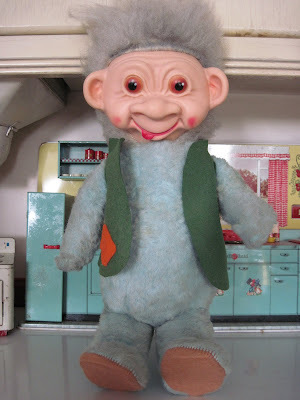 Here are a few unusual 1960s trolls that were made by the Marx Company. 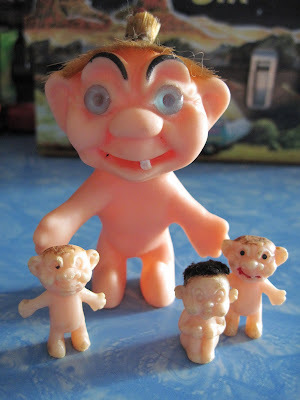 The larger 3 inch troll was called "Lucky Lou", and came in several different expressions. His tiny companions, just 1 1/4 inches tall, are from the fantabulous Marx Troll Village, a playset I have yet to acquire. You'll be the first to know when I do, though! In the mid-1960s, Batmania swept the nation as a result of the hit TV show starring Adam West and Burt Ward. 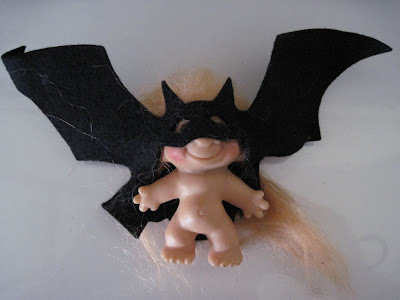 Batman iconography was extended to every product imaginable, including the contemporaneous fad toys, the troll dolls. 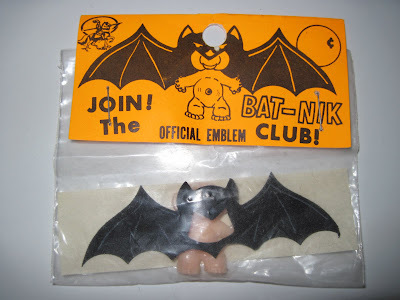 Below are a few Batman related troll items from my collection. First up is this large 5 1/2 inch Uneeda Wishnik Batman troll in his colorfully silkscreened costume. 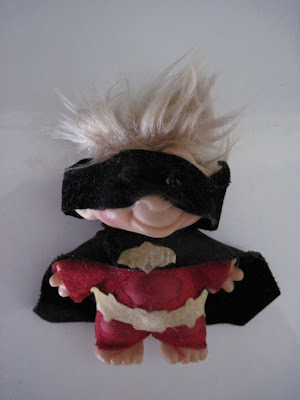 He retains his original, and unusual, bulging plastic eyes, but has lost his cowl and cape, which is typical for this troll. 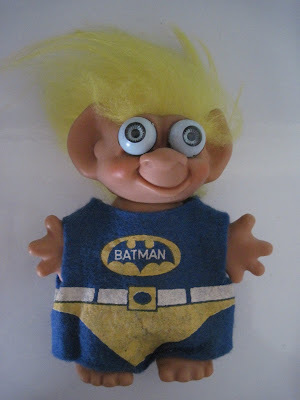 Next we have a rather uncommon 3 inch troll wearing a one-piece winged cape and cowl. This troll is seldom seen, and it was really exciting to find one.